← Choice – not coercion. On defining women by relationship to others. Home » Religious and spiritual » Nativity scene with Magi – I almost missed the best part. Nativity scene with Magi – I almost missed the best part. 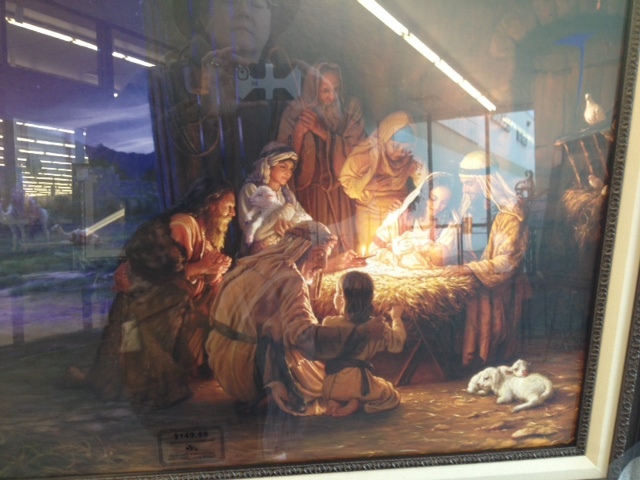 I saw a picture of the nativity that took my breath away recently. Maybe it was the size. The picture is maybe three feet high by four feet across. Maybe it is the colors. Maybe it is the composition. Maybe it is all of it together, and more. I apologize for the pictures. 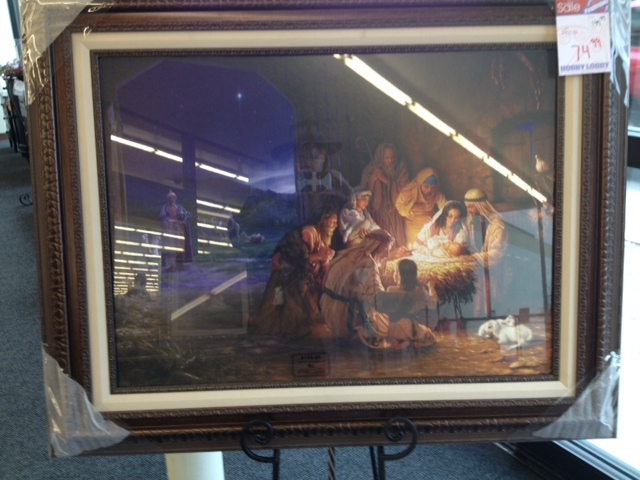 It is framed behind glass and there are a lot of fluorescent lights at the store. But, something is better than nothing. The first thing that got my attention is the tender scene of the Holy Family. It is to the right of the picture, bathed in light. It appears that all the light is coming from Jesus. 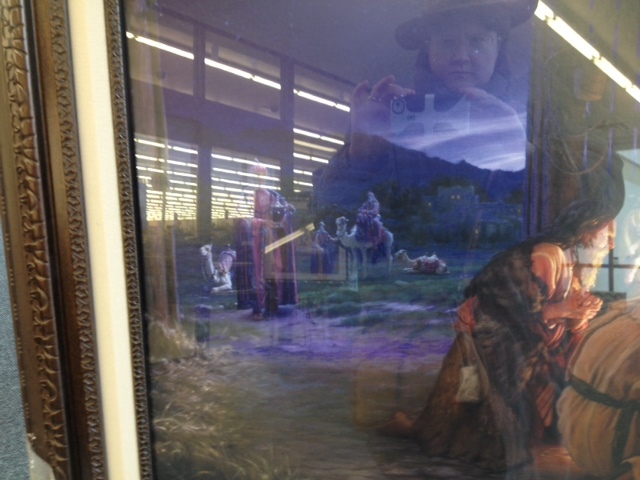 Then I notice the shepherds kneeling, holding a candle for light, admiring Jesus. They were the first to be told by an angel that the Messiah had been born. They are joyous and overwhelmed. What they have waited for has finally happened. A dove looks on. This is the dove of peace, the dove of the Holy Spirit, and the dove of Noah, all at the same time. Doves are powerful symbols. Then I wondered where the Magi were. There is no logical reason for thinking this. They don’t appear until 12 days later. The shepherds and the Magi aren’t together in the story, so they shouldn’t be together in this image. Then I pan over, looking to the left. There they are, just getting off their camels. There they are, just about to come in. The artist has shown a moment in time, just for us, the viewer to see. The Magi haven’t seen Jesus yet, but they know He is there. He is the reason for their long journey. Mary and Joseph haven’t seen the Magi yet. They don’t even know they are coming. They are still overwhelmed with the miracle that has just happened to them. It is just us, the viewers, who are privy to this scene. We see it all. It nearly made me cry, to see this moment. To think that I am seeing this slice of history. And to think I almost missed it. The Magi were there all along. We read from left to right in America, and we view pictures the same way. Once you learn a pattern it is hard to break. I almost missed the Magi because I jumped straight ahead to Jesus. When I saw them it was such a surprise that I gasped a little. There they were, and I almost missed them. How often do we do this? We jump ahead to the good part, forgetting that it is all the good part. We forget that everything counts, every character, every brush stroke. We only see a piece and we miss out on the big picture. The Magi are coming. They are on their way. They are in the desert, wandering like the Jews did, but not for forty years. They are following the same God who leads us all to freedom. At the end of the journey lies redemption, and proof that God is here, with us. This entry was posted in Religious and spiritual and tagged Christmas, God, Holy Family, Jesus, Magi, Nativity, Three Wise Men, wandering in the desert. Bookmark the permalink.